-Grocery items are automatically separated into different categories on the list. So if you need to pick up orange juice and tropical juice, those items will appear right next to each other on your grocery list. No more running back and forth across the grocery store trying to find the things you need! -Add items to your grocery list from Greenlist’s extensive list of products. That means you don’t have to manually write out each food item. If you do freelance work, then you probably know what it’s like to be buried under an avalanche of projects or forget about a certain project – even if you’ve written that project down somewhere. A new Android app called Lancer is the app that freelancers need to keep track of their work. Lancer allows you to add new jobs, set deadlines, keep track of expenses, and place the project on a map. Whether you’re visiting somebody’s home or working from your own house, Lancer makes it easy to stay on track and on task. Lancer will also keep track of your wages. So if you get paid a different rate for different projects, then you can monitor that and automatically create an invoice to clients when the project is complete. If you’re a freelance anything, then this app deserves a try. I live in a big city, so finding network connections is never a problem. However, even when I’m in the middle of the city, my network reception can drop to two or three bars. The problem, apparently, has to do with the cellular tower to which you’re currently connected. When you move around a city, your phone will try to hang on to a certain cell phone tower – even if that tower isn’t the most ideal choice. This leaves users with low reception and slower-than-necessary data connections. And that’s why Signal Booster is a good app. Signal Booster scans your area to find the cell phone tower with the best reception. Just install the app, tap a single button, and you should receive a better signal shortly. The app claims that the number of bars on your phone might not go up, although the actual speed of your connection always increases (provided there’s a nearby cell phone tower). And even if you don’t live in a big city, you can run the Signal Booster app for Android to find the best possible cell signal. The app’s developers suggest running the app on a daily basis, as well as when you move to a new location – like when you travel from home to the office or school. And if you’re wondering how many cell towers there are in a large city, there are approximately 1,000 cell towers in the city of Calgary, which is home to just over a million people. So your phone has plenty of options to choose from. It just doesn’t always choose the right one. 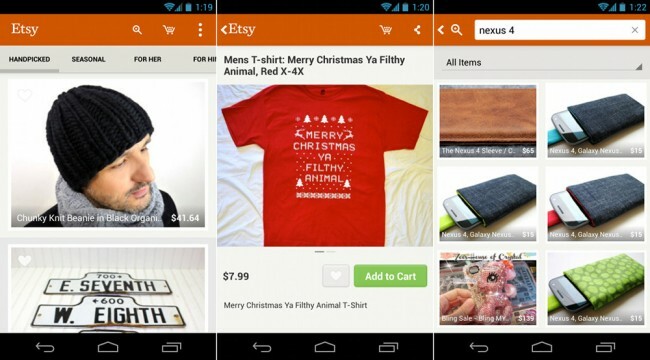 Etsy has finally made its way to Android. If you haven’t already heard of Etsy, it’s a massive network of crafting enthusiasts who make everything from knitted pillows to charms and bracelets. And thanks to the Etsy app for Android, you can narrow down your list of sellers to certain parts of the world and view crafts based on popular categories. If you use Etsy on a regular basis – or want to see what all the hype is about – you need this app. Snapseed has been the most-discussed app release of the week. Snapseed is Instagram’s biggest competitor, and many argue that Snapseed is far superior to Instagram. And with over 3,000 reviews on the Google Play Store after just a week of use, Snapseed has a perfect five star rating. I don’t think I have ever seen a rating that high across so many reviews. So Snapseed is the real deal. If you’re bored of Instagram or never really understood it in the first place, Snapseed is one Android app you should check out this week.